If you are looking for a passionate romance, witty dialogues with fluent narration, handsome doctor and a happily-ever-after, then ‘The Cure Was Love’ is the story for you. And this is the first time I have read a story with Indian characters in American setting, complete with Macy’s parade and Thanksgiving celebrations, totally entertaining. Gorgeous Simi (going to be a doctor) meets Rudy (a handsome surgeon with bad handwriting), in his pyjama top, on a cold November night, with Murphy’s law in full force. The night includes a dog, a bullet and a twisted ankle, and Simi ends up under his scalpel. Intriguing! Reet Singh has penned a charming story, which is thrilling and humorous at the beginning, goes on to become emotional with the right amount of mush, to being passionate, then tugs at your heart when the lovers are separated due to external circumstances and their own misgivings. Eventually they get united in India, with dashing Colonel Shamsher Singh playing the part of cupid to perfection. Simi’s character truly reflects the Indian girl’s shyness, courage and honesty, whereas Rudy is the perfect hero showing compassion, understanding and maturity in the face of Simi’s uncertainties. The fire between the two ignites slowly and sizzles as they helplessly fall for each other. A highly recommended read for romance lovers. When Mills and Boon® India announced the Passions Contests looking for aspiring romance writers from India, she decided to participate. When she won last year, there was no looking back. ‘Scorched by His Fire’ was released in February 2014, and the Kindle edition released later, in June. 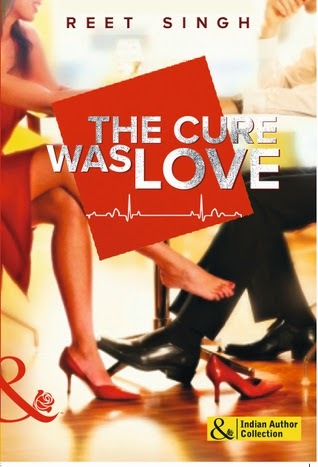 ‘The Cure Was Love’ is her third published piece of romantic fiction.